A trip to the dentist on May 28th. *shudder! * No fillings though, three cheers!! good shot - I've never looked at the instruments carefully before. You know, we never need a reminder of what those instruments look like! Euw! Still very early in the morning for a photo like that :) I'm nearly ready for a muffin though. And another coffee. No reminder for me either. I'm in the process of having a crown made, and it's taken an extra appointment. Hopefully I'll be done this week. I'm not sure if I want a photo of the dentist office in my collection or not! Yet another photo that evokes an actual physical reaction. And my trips to the dentist usually aren't even bad! Still... shudder & cringe. Eeeeeeek! I think Cheri's comment is right on point, Mel. You've really become a great photographer at capturing "every day" photos that elicit a very strong response. 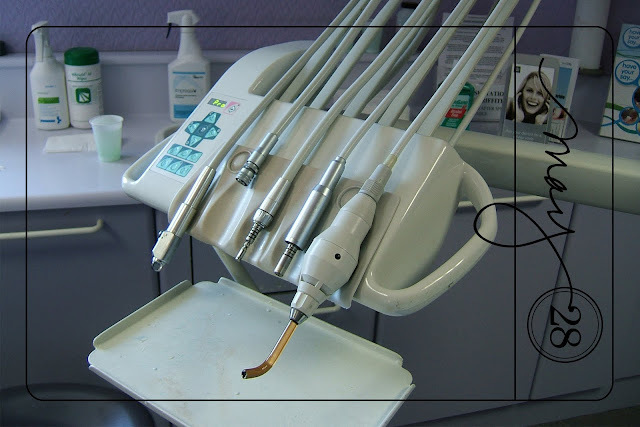 Uuugh - chilling photo of the dentist's instruments! Rinda - well said! !